View cart “Belding-Corticelli 1/0 #228 Pure Silk” has been added to your cart. Pearsall’s is the good stuff. And it is about to go extinct. 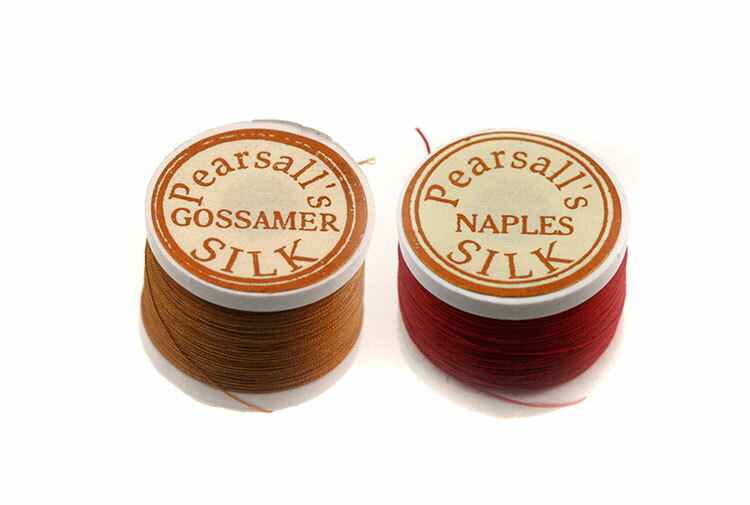 All Pearsall’s Silk Sales Are Final. No Exceptions. Thanks For Your Understanding. Update 3/19/19 – Hot Orange sold out, again. We’ll add more to inventory if possible. Update 1/15/19 – We’re very low on most colors, we’ve sold out of a few colors and others will definitely sell out this winter. Our inventory of Gossamer Claret – always popular – has now dropped below four dozen spools. If you need a stash, now is the time to make that happen. That said, we recently purchased another stash of mint condition Pearsall’s from a retiring rodmaker. Golden Witch’s original inventory of Pearsall’s had a maximum price per spool of $12.95; inventory purchased after the demise of Pearsall’s will be priced appropriately so we can make our margins. No two ways about it, this stuff is getting expensive. We had sold out of Gossamer Hot Orange & Naples Classic Chestnut last year; on 1/12/19 we added a very limited number of spools, both colors, into inventory. Fellow rodmakers & restorationists, It is with immense sadness that we must announce the near extinction of the Pearsall’s line of silks. From what we’ve been able to learn, Pearsall’s stopped producing silks for the fly tying and rod whipping ends of the angling world several years ago. Everyone who wraps rods with Pearsall’s has been living on borrowed time, as the reserves of inventory slowly dwindled, both here in the U.S. and ‘back home’ in Britain. We kept our prices low for years and years because there was no urgency, no sense that the inventory reserves would fail. But they had to. With our most recent order, we ran up against the harsh reality of unfulfilled lines in our purchase order marked “No Longer Available.” Grim words. Thankfully we had decent in-house reserves of most colors, so we’ll be able to offer Pearsall’s silks for another year or so. Get them while you can. Black Gossamer is 100% gone; Purple is 100% gone. We have no inventory in these two colors. As I type this update, we’re down to five spools of Cardinal. Several colors are only a few dozen spools deep in our inventory…as a sampling on 11/10/17 we’ve got 51 Dark Olive; 44 Light Olive; 48 Highland Green; 46 Brown; 48 Dark Claret in Gossamer…In Naples, we’re down to 36 spools of Scarlet and 37 of Black. Inventory changes daily, so please don’t put much stock (pun intended) in this list if you’re reading this note after the tenth of November. As many of you know, once a silk goes out of stock, forever, the value of the spools climbs to the point where it’s unattainable for all but the most serious restorationists. Market pricing sets in as inventories around the world diminish. Out of production silk is like a dead lobster. Not nearly so tasty, true, but a valuable and limited resource none-the-less, and priced accordingly. Our remaining stocks of Pearsall’s silks reflect market pricing as best as we can discern it. Black Gossamer is priceless, only because we have none to offer. Purple was $12.95/spool until it sold out, and the other colors drift downwards toward $5.95…but all will trend upwards as we reach the end of our stocks. We’ve heard that other vendors are also selling down, and out, of Black Gossamer; every other color will follow suit. As FYI, some colors are less expensive because they’re not popular with rodmakers. Some are less expensive because our importer still has stock on hand. Some are more expensive because our bins are nearly empty and we can’t get more. Buy what you need, but not more than you need. For my own part, I have a precious reserve of Classic Chestnut set aside. That’s my favorite color for rod wrapping. What’s yours? Orders will be treated first come, first serve. The fact that you got the silk into your shopping cart does not mean we have it in stock. Orders are not considered final until we pick your silk into your bin prior to shipping. We’ll refund any excess amount you paid if you order more than we have available (and we’ll remove that color from inventory). Inventory changes by the hour, so please don’t write to ask if we have a color in stock, just order it. If it’s there when we pick your order, it’s yours at the price indicated on the website at the time you submitted your order. We’ll aim to remove colors from the on-line inventory within 24 hours of them running dry. This sell-down could take months, or a year in some cases…days in other cases. If a color is not listed, it’s sold out. Please don’t write to ask if we have back stock – we don’t. If we can locate more of a given color, we’ll re-list it, but don’t get your hopes up. Pearsall’s is what the hobbyists have discovered over the past decade. Pearsall’s has a history that extends back over 200 years. Its fine diameter and soft twist equate to smoother wraps with fewer gaps, as well as promoting the even absorption of finish. Because it is made from long strands of continuous filament silk, rather than choppy, spun silk, it has far fewer of the dread fuzzies that can foul your finish. Properly burnished and finished, this silk looks as though it has been poured in place. Pearsall’s comes in two diameters. Their ethereal Gossamer is the finest silk on the market. In the elusive “ought” ratings, Gossamer is 6/0, if not a bit finer. Naples is roughly 4/0. Naples is about the same diameter, maybe even a mite heavier, than Japanese #100, which is claimed to have an equivalent 3/0 rating. Marketing, marketing. Until Pearsall’s, and the other brands, all adopt a scientific standard, such as the “TEX” ratings, diameter will remain slightly mysterious and thus continue to foster arguments between the various partisans. Suffice to say, the Gossamer is aptly named and the Naples is still a very fine diameter thread. Naples is a bit easier to wrap with and, some say, preferable for wrapping ferrule tabs even if the guides are wrapped in gossamer. If you’re tipping, there’s no doubt that a tiny spool of Gossamer silk is unparalleled for the task. All seventeen standard colors and all six classic rodmaking colors are available in the Gossamer diameter. Naples offers a more limited palette, but does include the rodmaking colors along with Black and Scarlet. Please see the color chart. The custom-dyed lot of jasper is currently the only jasper silk being produced for rodmakers, and it is far more affordable than what the collectors will charge for a spool of original Heddon silk. We also have Java Brown (similar to Jim Payne’s Java Beige), Antique Gold (similar to Lyle Dickerson’s favorite), and Classic Chestnut (which matches some Wes Jordan rods), Royal Hunt, and Straw. No additional classic rodmaking colors will be issued by Pearsall’s. That’s a shame. However, we can all count ourselves fortunate that they did develop, and continue to produce, the current colors. If you haven’t tried Pearsall’s Silks, you’re missing out.